This past Sunday, I ran the 28th presentation of the Big Sur International Marathon – – – and my second 26.2! While the name features the “main event” – the marathon – this event had several other component races to it: 5K, 9 mile, 10.6 mile, 21 mile, and a marathon relay (two to five people.) It was a massive undertaking by the race organizers, the timing company, law enforcement and military, and volunteers – one that was extremely well done! The weather was perfect: about 46 degrees at the start and overcast. There wasn’t too much wind to speak of at the start area; but, as expected, it was breezy on the course…though not as much as I’ve heard it was last year. Over the course of the marathon, the weather went from cloudy, to sunny, to light fog/clouds, to VERY nice at the finish. One word for the course: beautiful. Flat out BEAUTIFUL! Beautiful enough that I broke form and took pictures, knowing I was sacrificing my goal time for the race. The course is a point-to-point, that starts at Pfeiffer State Park in Big Sur and makes its way North along Highway 1 and finishes in Carmel. Course support was excellent as was the on-course entertainment: a couple of bands, the Taiko Drums, and the pianist at Hurricane Point, to name a few. The post-race expo was great (food, drink, etc.) I got my SWAG, looked around, and went to the finish line to watch people come across – looking for two friends who were also running. I only got to see one finish, as there was a massive amount of people – a bummer! All in all, a great race and one that I will be back to do again…and again! 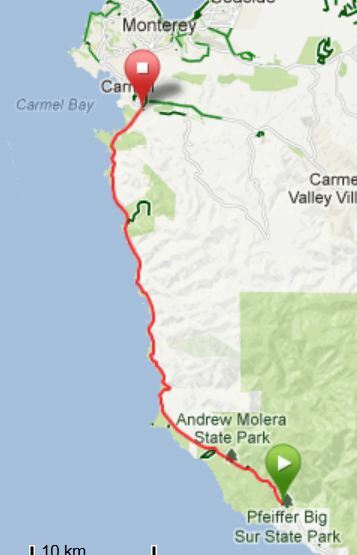 My goal for Big Sur was 3:51:16 (based on using the McMillan Calculator) – and I know I could have accomplished that, at least that is what I’m telling myself. That said, I (as usual) went out a tad fast and tired toward the end – actually the second half. I also made the choice to stop several times and take pictures, use the portapotty, and eat some strawberries (things I normally would not have done during a race.) Rightly so, I did walk ahead of what felt like oncoming cramps in my calves a few times as well. All that to say, I know I should be happy, but when you know you could have done better, it stings a bit. The upside is that when I registered back in July of 2012, my goal time was 4:35, so my 3:59:45 was still ahead of that. I know, I know, “you finished sub-four!” – so I’ll moooove on…. What a day! One with highs and not-so-highs (see, I’m not calling ’em lows!) The culmination of 18 weeks of training: 740.76 total miles over 95 days and 106:57:27 in time (h:m:s) – Whew! I drove to Monterey on Saturday around 1200, hit the expo, then checked into my hotel – which was just up the street from where the buses would be loading on Sunday AM. The expo was pretty good and had the usual fare of vendors and such. I was solo on this trip, so when I got back to the hotel room, I got my kit set up, walked across the street and got Chinese take-out, and then hunkered down in the hotel room. I actually watch old-school TV (Emergency!, Hogans Heroes, and Batman) until about 8:30, then went to sleep – 0245 would be an early wake up to catch my 0400 bus. I slept pretty sound, though I did wake up a few times. Knowing that I’d probably do that, I had gotten quite a bit of sleep previously that week during my business trip to Virginia. I got up at 0245, showered, got dressed, packed, and took my duffel bag to the car. On my way back to the room to grab my backpack and check out, I heard running water in my room – “Did I leave the water running? NO!” When I went into the room, water was pouring from the ceiling in the bathroom and closet area! I rushed to the office to let them know, tell them that they better check things out on the second floor, and then quickly checked out. I DID NOT want to get stuck there dealing with that mess! I made it to the buses at about 0345 and jumped on early, heading to the start line. I tried to sleep, but just rested with my eyes closed. It was a great way to relax and zone out ahead of the race. It was totally dark, but as we hit Hurricane Point, it was pretty ominous to see the taillights from the line of buses heading down the 2-mile hill that we all would be running up in about two hours. We got to the start area and I hit the portapotty, then found a curb to sit on and chilled, talking with a few fellow runners. At about one hour before start time, I hit the portapoty again, then got ready (compression sleeves, arm sleeves, gloves, etc.) When they called for each of the three waves to head for the start, I checked my sweat bag, and joined the masses. I lined up in the second wave at the 4:14 finish section, figuring it would force me to start slower. Speeches were made, the National Anthem was sung, then the first wave left. At 0651, we were off! The first half was great and close to my pacing plan, which I had on an wristband. I ended up with a faster-than-planned split and paid for it on the second half. As I mentioned above, I chose to stop for pictures, potty, and strawberries and also walked several times when I felt some cramping coming on during the second half. Parts of my usual training course at home includes several, long straightaways where I usually zone out. That paid off during the straightaway during miles 6 through 8. Hurricane Point. I’m glad I trained with my HP sim. It took the ominousness out of the hill. It didn’t make it any easier, but I was prepared and only walked briefly two times over the two-mile hill. I’d read about the psychological aspects of it seeming to be ending “just around the corner” and that was accurate. You do feel a huge sense of accomplishment when you reach the summit…then realize that you still have another half marathon to go! The only complaint that I have about the race was the Camelbak self refill stations. Some were excellent (area marked and person there ready to help), some not so good (area marked, but self-serve), some terrible (empty pitchers!) It’s a whine, I know. I’m always nervous about wearing my RUN IT FAST Club shirt at races…will I live up to it and represent?!?! It’s a head game I know, but I went for it and wore my new, black RIF shirt. I got a lot of shoutouts and encouragement on the course, which was cool and also met a fellow club member at the start line – and also got to see him sprint to the finish! GO ROB! At the start, they had the Race director from the Boston Marathon share some thoughts. You could sense the emotion in the crowd as he shared and went on to say, “We runners have a kindred spirit. We run as one.” One sobering part of the day was when I spent about 30 minutes at the finish line. I wrote about that above, but the sobering part was thinking about what happened in Boston. I got chills. So sad. Such a senseless act. I followed my normal pre-race carb loading plan (36 hours of >80% carbs and +1000 calories above my normal day) and my usual race fueling plan (bagel at -3 hours, GU at -45 min, GU & salt tab at -15 minutes, and GU Brew along the way, an additional salt tab every hour, and GU Gels along the way.) I did pop a few extra salt tabs on course, as I felt cramps developing. Based on my race, I’m thinking about tweaking my nutrition strategy, specifically on the second half of the race. I’m researching! After a while, I caught the bus back to Monterey, walked back to the hotel (ok, trudged), and then drove home. The water disaster in my room…RUN! Bottom line: AWESOME DAY! Beautiful scenery! Wonderful environment for runners! A new marathon PR! Post-race meal: Double Whopper with Cheese, Large fries, and a Diet Coke! Training Takeaways: Need to work on pacing and running at a slower pace when needed/planned. Need to experiment with mid-race nutrition, evenly spreading is probably not best for my run. Maybe add additional hill work to the plan. There’s probably more (I’m always learning), but that’s enough for now. GIDDY-UP … a 50K is a comin’ ! Comments: I did 5.39 @ 8:25. A little stiff, but feeling pretty good. Thanks – it was a great day and well worth the training. Thanks to stopping by – have a great weekend!